With a Fan and Parasol? Select an option with a Black Set! with a White Set! with a Cream Set! 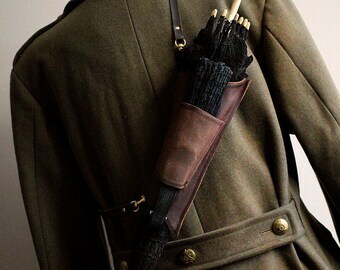 A brown leather Steampunk parasol holster is a great way to easily stash a parasol and fan, freeing up your hands and adding something interesting to your outfit too. This holder accessory has been custom designed and handmade out of a genuine brown leather to discretely allow the wearer to slip their parasol, or umbrella, out of the way and still keep it ready at a moments notice. This holster has also been lightly oiled to keep the leather subtle and soft for may years of use too, making it one less thing to fuss about and leaving more time for fun. 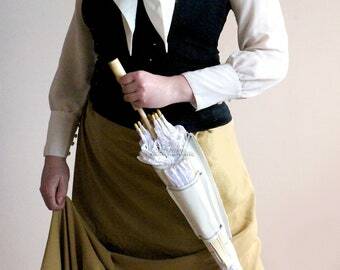 Simple in its features the holster is designed to compliment the modern lace parasol and fan sets available and is finished with a matching leather pocket sewn on the front-side to fit a fan. You can customize this listing by selecting how you want to wear the holster - either with an adjustable and removable shoulder strap, spring loaded clips, belt loops or steel clasps to further add versatility to your accessory. Can't decide which customization you want? The strap option is the most flexible one if you're undecided because it can be worn around the waist, across the chest or slung casually on the shoulder like a purse with lots of room to adjust the length for a personal level of comfort. And the fact that the strap can be clipped on or off makes it the most versatile option to invest in for maximum options. 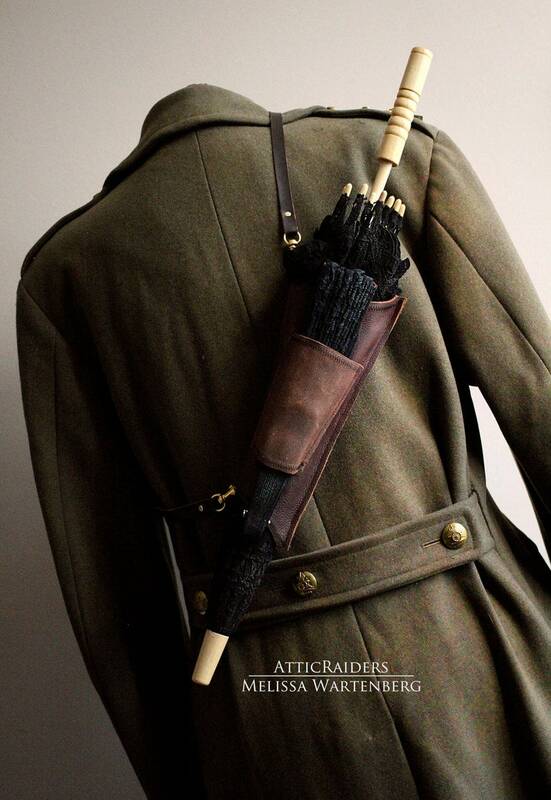 With other holsters available at AtticRaiders too, the handmade leather parasol holster is an easy accessory for festival goers, Steampunks or travellers to take with them along on the adventure. 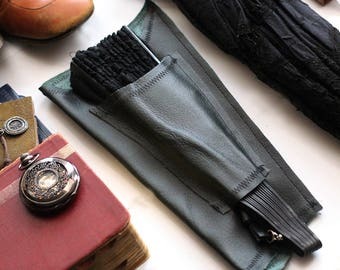 It folds up, rolls up or lays flat at the bottom of your luggage for an easy, no fuss lightweight steampunk accessory that turns heads and prompts conversation. 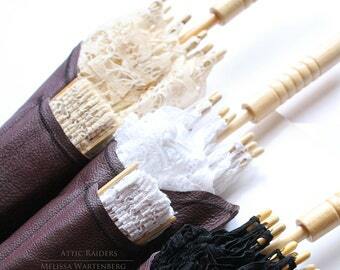 If you're on the hunt for a practical accessory that turns heads and adds something unique to your style, then consider a leather parasol by AtticRaiders for your next accessory addition and be hands free for when the adventure begins! *Holds most parasols of average shape, weight and length. Please check your parasol length and circumference while closed to ensure that this holster will fit your favorite parasol. 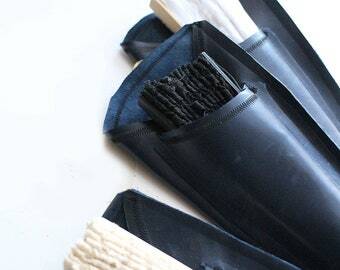 - one size holster fits most parasols! Copyright © 2009- Present and beyond belongs solely to AtticRaiders. The content herein, including but not limited to, all intellectual property, designs, materials and the selection and placement thereof in such designs, copy, text, photography, listing format and content is the sole and exclusive right of AtticRaiders and its subsidiaries and any attempt to copy or reproduce any of such designs, copy, text or content, by any means, electronic, manually, visually or otherwise is prohibited by law and all infringements, intentional or otherwise, shall be prosecuted to the full extent of the law.